WHJF is proud to be affiliated with the United States Equestrian Federation and the United States Hunter Jumper Association. 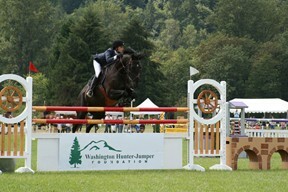 The Washington Hunter-Jumper Foundation is a public charity dedicated to expanding and improving the hunter-jumper equestrian disciplines within the State of Washington. Our objective is to increase public interest and participation in the sport by promoting educational events (horse shows/clinics) and providing scholarships and achievement opportunities to residents of the State of Washington.